Skender was recently named as one of the 2018 Best Places to Work in Illinois. Established in 2006, the awards program is facilitated by Daily Herald Business Ledger in partnership with the Human Resources Management Association of Chicago (HRMAC), MRA-The Management Association, Illinois Chamber of Commerce and Small Business Advocacy Council. This statewide program is designed to identify, recognize and honor the best places of employment in Illinois, benefiting the state’s economy, workforce and businesses. Skender took home the second-place honor in the mid-sized company category. “The Skender community is made up of incredibly talented and innovative individuals that make it refreshing to come to work every day and extend our core values to our clients. Every employee at Skender impacts the environment through thoughtful contributions to our cultural framework,” said Lisa Latronico, Skender Vice President of People and Culture. Companies from across the state entered the two-part process to determine the Best Places to Work in Illinois. The first part consisted of evaluating each nominated company’s workplace policies, practices and demographics. The second part consisted of an employee survey to measure the employee experience. The combined scores determined the top companies and the final ranking. Best Companies Group managed the overall registration and survey process in Illinois as well as analyzed the data to determine the final rankings. 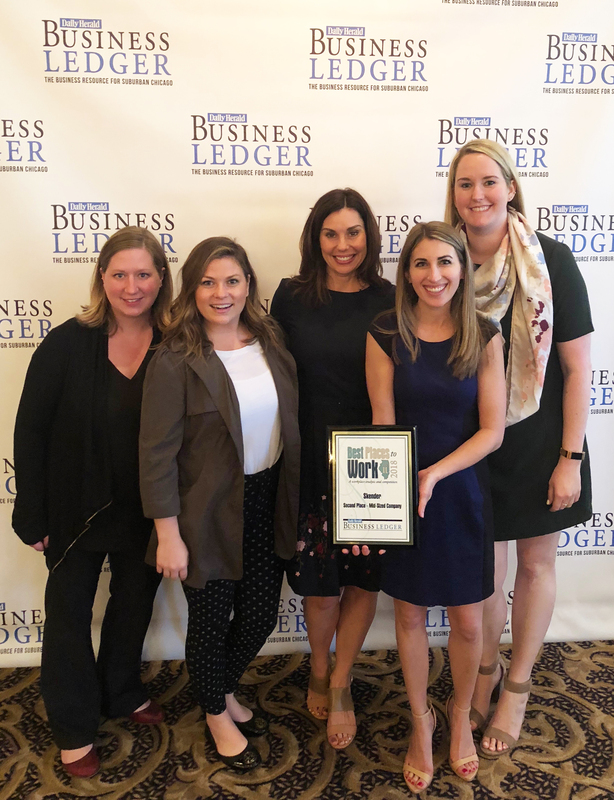 Skender was one of 75 companies recognized and honored at the Best Places to Work in Illinois awards ceremony hosted by Daily Herald Business Ledger on May 17 and will be profiled in a special publication. This recognition is the 22nd best-place-to-work award won by Skender over the last decade. Earlier this year, Skender was named the No. 6 Best Place to Work in Chicago by Crain’s Chicago Business.